The U.S. transportation infrastructure market is expected to grow 4.2 percent in 2019, according to the annual economic forecast released Dec. 5 by the American Road &Transportation Builders Association. Yet a report issued by Fitch Ratings, also on Dec. 5, cautioned that “external factors” such as “protectionist trade policies, rising interest rates and volatility in fuel prices” bear close watch. ARTBA Chief Economist Alison Premo Black stressed in her group’s economic forecast that increased transportation investment by federal, state, and local governments will help drive the growth across all modes, with total domestic transportation construction and related-market activity projected to reach $278.1 billion, up from 2018’s $266.9 billion, after adjusting for project costs and inflation. 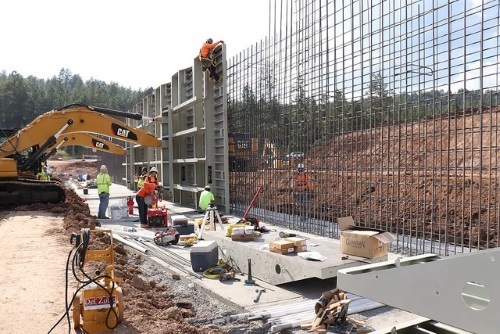 The transportation construction market also grew by 4.2 percent in 2018 compared to 2017, she said, driven largely by gains in airport terminal and runway construction, which increased by $5.8 billion, or 33 percent. Spending on public highway and street construction rose by $2.7 billion in 2018, according to ARTBA’s data. Although the overall U.S. transportation infrastructure market will see growth next year, the situation will likely vary significantly by state and region, according to ARTBA’s Black. For example, highway construction market activity is expected to increase in about half of the states and Washington, D.C., with activity “steady” in five states and “slowing down” in another 20, she said. Other market risks include uncertainty over material prices, increased labor costs and potential labor shortages in some regional markets, Black added. One wild card in the forecast, she stressed, is the outlook for the scheduled 2020 reauthorization of the Fixing America’s Surface Transportation or FAST Act law and the ability of Congress to find additional revenues to support the Highway Trust Fund. “If states start delaying transportation improvement projects in response to uncertainty over the future of the federal program, it will temper 2019 market growth,” Black noted.